One of the most prominent areas of focus in the robotics industry today is the design of more human-like robots. Giving human features to robots offers tremendous advantages compared to traditional designs; for example, some robots are now designed with human-like legs rather than wheels, which enables them to move more easily in dangerous environments and over obstacles. “Prototypes of the ADDAM robot and the robotic arm were built and performed as predicted by the simulation with a high degree of fidelity. 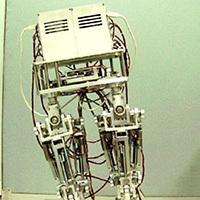 The ADDAM robot demonstrated human-like walking capabilities and met all of our other design objectives. The robotic arm can lift an object greater than 5 kg even though its own mass is only 2.2 kg.” - YongKwun Lee, Professor in the Department of Biorobotics in Kyusyu Sangyo University. Researchers are planning to improve on the design of ADDAM by using multibody simulation to further improve the capabilities of ADDAM, such as by enabling it to perform fast walking, running, jumping, turning, and lifting heavy weights.